The Morse is not technical but shallow, with no mandatory portages. The surrounding terrain is low and expect wind problems. Expect to see lots of muskox. Upper Garry lake, the Back river and Garry Lake, present the usual large body of water issues for the tundra. The Armark river is also shallow in areas, with technical sections and 3 mandatory portages. Those uncomfortable with running large waves & technical runs should plan on at least 5 more portages. The mandatory portages will not be surprises, they are very obvious. Three of the “optional portages are rapids with surprises at the bottom, two are obvious from the top. Bank scouting of rapids with bends is strongly recommended. Together as a trip these rivers are beautiful, very remote and require disciplined tripping skills. In low water they will be very arduous and are not recommended for the faint of heart. Be prepared for large charter costs! We had cold windy very wet weather pack accordingly. Carl, Doug & Pixie the adventure dog left Fort McMurray on June 26th for Yellowknife and arrived on the afternoon of the 27th. We were scheduled to fly out on the 29th, however we checked in with Air Tindi and a flight was available that evening and got out effectively 2 days early. This was sweet and a bit of a trip saver as I‘ll discuss later. We stopped in Reliance for fuel which provided a very good look at Pike’s portage and the Lockhart river after takeoff. Plan A was to be dropped off on a lake in the headwaters of the Morse. This early in the season, ice can be a real problem so alternatives are a good idea. Plan B was being dropped off at Ursus islands on the Thelon and working our way up a series of creeks and ponds to the Morse. This route was recommended as an easier route than starting at the west end of Beverly lake and working up in to the Morse from there. The Beverly lake route is known as the “rockturnal damnation” route in some quarters. We saw the Ursus islands route from the air and it would have been hard work! So the Beverly lake route must truly be nasty! We had no problems getting into the desired drop off @ 65° 2.376’ N 100° 45.901’ W at 2230 in the evening. We could see old tent rings from the air and they were in a nice spot to camp. I am not going to list every campsite but will note the special ones. Our critter count was much higher than we expected. 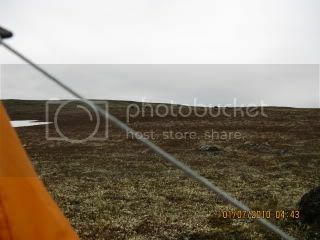 We saw 130+ muskox, 25 + wolves, 6000+ caribou (we didn’t expect to see any), 2 Sik Sik and a Pica. Lots of bald eagles, sand hill cranes, 3 species of loons, who knows how many duck species and a couple of million geese, swans and some brandts. No bears or wolverines. On the 29th we saw a huge herd of muskox 27+ with at least 8 calves, obviously they are doing well!. That night/morning @ 0430 Pixie woke me up with alert woofs. The same herd had carried on down the river bank and were in our camp site. Very cool! Carl slept through it all as I couldn’t wake him up with out causing a stampede. We take separate tents for a couple of reasons, SNORING!! Both of us have been known to snore and we are both light sleepers. Two tents keeps the peace and provides a back up in the event of a major failure. Through the 30th we ran numerous small rapids with several significant wades. Good weather during the days and life was good. July 1st was a wind & rain bound day. Able to move on the 2nd but still windy. 3rd through the 6th weather bound. It absolutely poured with high winds. At their peak the winds were in excess of 70kmh. Every thing was getting wet! We had lots of company, up to 18 Muskox in sight and wolves trotting by daily. On the 7th we got packed up and on the river before it started pouring. It rained very hard all day. We managed to move 20 km. For our trips we budget 20 km a day, on this trip we did that plus 6 days for weather & hiking. The extra time provided by the early flight was now looking to be great. On the 8th we were on upper Gary lake with loads of historic sites when we stopped for a break. The winds were favorable so we pushed on for Gary lake. This was a 42km day. Camped at 65° 53.552’ N 100°26.543 W it doesn’t look like much from shore but is well sheltered & worth the stop. It also works for anyone doing the Back river. On the 9th with much giggling and happiness thinking we through the main issues in the Gary lake we moved on. By 1215 were we proven wrong. The north arm of the lake was a brick! It was ice as far as the eye could see! In total about 30km worth! So we stopped in a nice spot (we finally had some sunny weather), took the opportunity to dry out pretty much every thing we had and hang out and hope for favorable winds to shift the ice. We did briefly discuss other trip options in the event of being unable to proceed on to the Armark or get all the way to the coast. On the 10th I was roasted out of my tent by 0820. After a leisurely breakfast & a bath, it became apparent that the winds (out of the west) were shifting the ice! We decided to try moving on (we were following the western shore as the eastern is significantly longer) and were able to make a total of 11.5 km before we stopped due to poor weather, that’s right more rain & high winds. This campsite at 66° 01.638’ N 100° 26.169’ doesn’t look like much from shore but it’s well sheltered from anything but a very strong wind out of the south, it’s pretty, it’s been used in the past, lots of tents rings on the higher ground and higher hills for scouting or good hiking are right there. along the way to do it which is a whole lot better than 26 km which would have been the case had the ice not shifted. We camped at 66° 10.237’ 100° 26.568’. Once again it didn’t look like much from shore but was workable and had been used a lot in the distant past judging from the very old tent rings and hearth in the area. On the 12th guess what? More hard rain & high winds and just to spice up a day of not moving, our bug shelter decided to blow out (the main tarp) in a big way. By 1700 the rain stopped (the wind didn’t) and by 1800 things were dried out enough to look at what to do for repairs. By 1920 we had a fix in place that with a few minor tweaks, held up for the rest of the trip. This shelter is a modified Layman design that Carl made and my guide tarp fit over it. So with some sewing and tying grommets together it worked really well. On the 13th the weather and we were off at 0915. At 0930 we could see Caribou! It turned out to be a herd of 600 or 700. The numbers can be hard to judge when they dense pack to deal with insects. However when they do that they look just like a banks of tan colored boulders and if the boulders move you know what’s up. We were able to paddle up to a low hill they moved behind and sneak up for a better look and pictures. I hung back with Pixie, who was on a leash at this point, no point in a causing a stampede. & Carl got some great shots. 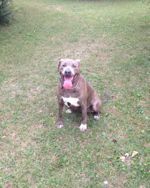 Pixie was pretty interested at first with no barking, then she got bored and played with a rock. This was the first day of the trip where insect repellant was a necessity. Between happiness at seeing the caribou and five years of bad navigation rolled in to one easy decision, we then proceeded up the wrong creek for 2 hours. 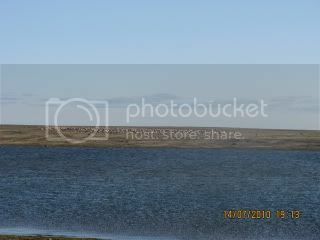 It was rather pretty and we may the first whites to paddle to the next lake, up stream, since Hearne? It only took another hour to get back down stream and get going up the correct stream. While we were having lunch 3 cows with 2 calves came by and swam the creek in front of us. The wind started picking up and of course it had to be a head wind. Later in the afternoon we saw a wolf trotting along with a pup on the bank. They moved off up stream and crossed the lakey section we were on at a narrows in front of us. 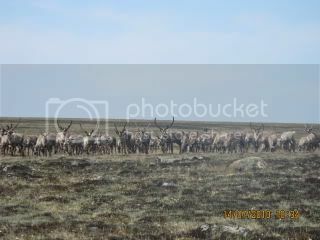 As we were getting to last lake at the end of the string we saw a big herd of caribou, at the time we estimated 2000 to 3000. We stopped for the day a little later on an island at the beginning of the last lake and the caribou moved north and let us watch them for quite some time. From the vantage point of the higher ground on the island it was quite apparent that our original estimate was low and that there were least 5000 animals present. We saw two wolves along the portage & had a solo cow caribou checking us out in our camp site on Armark lake. A fairly significant thunder storm rolled through at 0200. 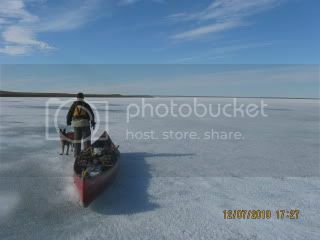 The 15th found us on Armark lake on a high smoke day, and we saw a caribou right after putting in. I had seen two wolves earlier in the morning in the same location. We had no problems getting to the other end of the lake and started down the river & ran a small rapid. 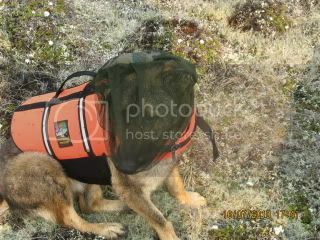 We camped, 66° 35.405’ N 100°50.692W, about 300m downstream of the rapid and finally the mosquitoes hit true tundra numbers requiring bug jackets & a head net for Pixie. The 16th was a good day, we saw 8 Musk Ox just downstream the put in. We ran 22 drops for the day. One of which should get a special mention. It is located at 66 41.442 N 100 51.033 W and consists a bit technical run of the top half and an unrunnable boulder fan for the remainder. We ran the top section, grounded out in the pool below, and waded the boulder fan. Insert photo This rapid is probably one of the probable portages for most folks. Toward the end of the day we ran two boulder fans that had big waves at the bottom. In lower water it wouldn’t work. We ran everything open (this was probably a retarded thing) and got really wet in the last boulder fans. It was a nice day. We camped across the river from the last boulder fan at 66° 47.753 N 100° 46.796’ W.
On the 17th we saw 8 Muskox about a half hour after starting for the day and ran 1 small rapid before entering lake 137 (its nominal elevation) & saw another 6 muskox on the shore. Coming out of lake 137 we ran 8 rapids a couple of which were pretty substantial. They were all boulder fans. We had a couple of long wades one of which had 6 snoozing muskox on one side and a big bull on the other. .
We could see a thunderstorm coming and set up camp in the nick of time. After supper we had a caribou check us out. The 18th had us passing through area with a couple of areas with multiple rapid bars. Well the big scary rapids weren’t very big or scary we ran them all. We made it past lake 78 & ran a fairly significant rapid with a large compression at the bottom. A deck is mandatory for this one and scouting recommended for lower skill levels, another potential portage. BTW it doesn’t warrant a rapid bar on the map. We camped just below this rapid at 67° 17.687’ N 100° 50.423’ W.
On the 19th was dark & dreary and we ran a really significant rapid 2 .4 km downstream @ 67° 18.566” N 100° 49.601’ W. It’s not marked at all on the maps and deserves 2 bars. Scouting is mandatory and most will elect to portage this one. We ran 6 more small rapids before camping. 67° 35.122’ N 101° 02.292’ W. Scouting is mandatory and most will elect to portage this one. We ran the far left hand channel. Below this rapid the camping gets pretty crappy! We encountered another mandatory portage at 67° 36.011’ N 101° 03.369 W we camped about 1.5 km downstream. 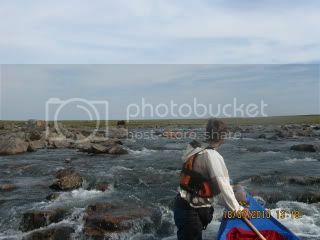 The 21st was a good day we ran 8 or 9 rapids & got to the last mandatory portage at 67° 42.128’ N 101° 06.986’ W then it was a gentle paddle to the sea, keep left to get to a good pick up location. Our camp was at 67° 46.088’ N 101° 04.245’ W.
On the 22nd We were picked up at 67° 46.597’ N 101° 03.072 W at 1430. We got back to Yellowknife to find out my truck had been towed. It took 1 ½ hours to locate it and bail it out. THANK YOU AIR TINDI dispatch for all the help sorting this one out! On the 23rd we drove all the way home. Pixie slept most of the way. Nice report - sounds like a great trip. Cool report and even cooler dog! Wow, lots of wildlife and an interesting route. Thanks for sharing! Sounds like an awesome trip! 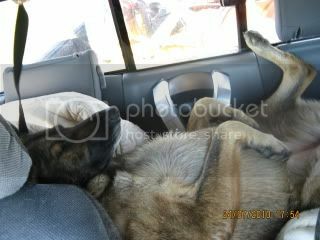 I love that picture of your doggie sleeping in the car...ha ha cute!! Thanks Doug! This summer's trip I was down in the trees. Nice to be taken vicariously back up to the Barrens! lets see if this works! It the cross over route we used! Thanks for sharing your trip Doug. We were on the Western in July and like your experience, the weather was not ideal this year. "We got back to Yellowknife to find out my truck had been towed". Same thing happened to our minivan in Yellowknife - with the unexpected and discouraging $210 bill to get it back. At the time I was wondering if they were picking on us because of the Ontario license plate. Guess not. Great map of your route, thanks. I'm impressed with the quick time you made from the Back to Amark Lake. It sounds like one day to cover the height of land. Your route looks pretty flat but even with the rains I'm sure it wasn't a walk in the park. Open and treeless yes, but still up creeks, and over land--loading and unloading gear, etc. I'm impressed with the quick time you made from the Back to Amark Lake. It sounds like one day to cover the height of land. It was a lot easier than we thought due to the wet weather. We were ready to camp along the way but it wasn't necessary. Paddling up the creeks,3000m of walking, one drag up a creek, & a bunch of short paddles. The Western is on the bucket list, other than the cold wet weather how was it?